Get lost in the power and might, and the never-ending fight between good and evil! From the streets of New York City to the Danger Room in Professor X's School for Gifted Youngsters, welcome to the Marvel Universe! 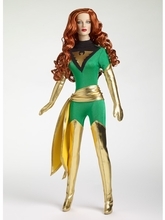 Tonner's Marvel Universe Character Figures™ are inspired by the super heroes and villains of Marvel Comics.